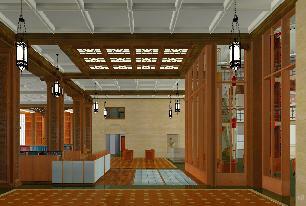 The main entrance lobby at the Pennsylvania Academy of Fine Art was a Frank Furness design which had been restored by Bob Venturi. When Dagit • Saylor designed a renovation/expansion of the building across the street for PAFA, it made sense to link the buildings with an underground corridor. 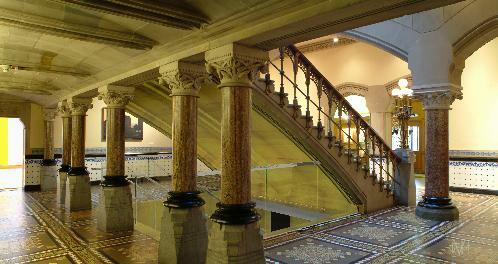 The entrance to that corridor was proposed to be under the original stairway. A uproar developed, and a visualization was commissioned to show what the new stairway would look like. Here is the after. 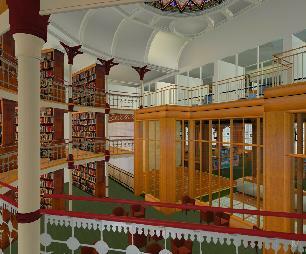 The Linderman Library at Lehigh University will be undergoing a renovation designed by MGA Partners of Philadelphia. The new lobby design increases the visual link between two existing spaces in the library both of which are very rich and complex spaces. This proposed one story addition to an existing 3 story school builiding in northeast Philadelphia was designed in association with Philip E. Franks Architects in 2003. This elementary school was designed by DWKCB, Inc. for the Perkiomen Valley School District. 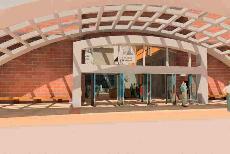 This visualization was done in 2002 to portray the architecture and site design. Still images taken from the animations in the video, Imagine a Place, which was produced by Mark Moscowitz for The National Constitution Center in 1997. Studies of the space designated for the archive collection of the Union League of Philadelphia, on the third floor of the league house, for William Post Thomas in 2001.